My young friend! Humans have lived in this land their creator called Wesnoth. But this name is long forgotten. And now the human race is about to be defeated. Their ambitious attempts to create a world under their control had a devasting effect on the nature. The river that once supplied their powerful and thriving metropolis of Capital City dried out, farmland and supplies run short. The desert in the south grows each year and even the alliance between the merfolk, dwarves, elves and humans has scattered. This is our time. The humans drove us into the north to die, but we will return with the strength and the fury of a wounded bear. They want us to die, being responsible for their mistakes? They are wrong! Call the tribes and raise your weapons, let's drive these hairless monkies over the sea, where they came from! Unknown fragment of an orcish letter. Found before the invasion of the orcs. Signed, Librarist Themaria - Temple of the Holy Light. 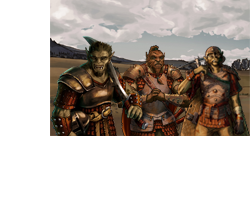 The orcish invasion came so quickly and the human alliance was so unprepared, that half of the northland fell into the hands of the orcs within one year. The winter stopped their approach, but this wasn't my problem. I never cared much for policy. I heard an old man babbling about some old legend: It speaks of three heroes that once defeated an orcish overlord with grey skin, that was about to conquer the entire world. Well, - a good story, if you like to listen to stories like that. But there is no hero in this story and after all an orcish overlord can't be that bad, can he? I grew up in poverty. My parents weren't rich, but we weren't poor either. I don't remember how they died. My uncle told me, that it was an accident. My uncle is 'Scarface', a brute of a man and a cunning merchant. I was frightened to live with him in first place, but he turned out to be a good man, if not a friend. I started to work in the trading company of my uncle. It was hard work as it was a small firm, which meant a lot of overtime even though I was a kid. I sometimes believe that my uncle dealt partly in illegal goods, but I could never prove it. One day to the other my uncle was gone, without leaving a message. According to his traces, he left our house in a hurry and under mysterious circumstances. I believed to see the sheme of a man sneaking around the house, but I've never been able to catch him. After several days I finally received a letter containing several hundred gold pieces. Shocked, as I had never seen such a quantity of gold, I almost forgot to read the text. Dear John, I had to leave the place due to some old stories. I really regret that I can't tell you more, but this last big deal will help me to finally retire. Meanwhile you should try to run your own business. The time for you has come to become self-sufficient! Don't worry - you will make it! The old Betsy will help you to transport goods with your cart. Travel from town to town and try to buy goods cheap and sell them for a good price. This is not the only way to earn money, but its the fastest. If you don't like that, sell the cart and try something different. You are smart, you will make it! But gold isn't the only thing that is important: Fame represents your reputation and connections. Fame will help you to discover new markets and unlock new options! Good luck on your way, I will be back in a month or two! The Story of Strange Legacy takes place in a fictive future in the Battle for Wesnoth Universe. The landscape is related to the original map around Weldyn, but some changes were made. The npc characters are connected to other addons such as 'Trapped' and 'Five Fates'. While in Five Fates Scarface is on of the protagonists, trying to loot treasures, he is also one of the three protagonists in 'Trapped'. Sneaky Feet, who appears as a side kick in Five Fates, and Bullseye are also protagonists from Trapped. The 'Shadow' and his daughter also known as 'Swampwitch' are linked to the halfvampire in Five Fates.